Although Iraq and Syria are in the heart of the Arab world and in the tradition of Islam the goal of the Islamic State is not just to form a Caliphate in those countries and to establish yet another Islamic Country but to establish a Worldwide Muslim Caliphate, to challenge the European dominance and political heritage and, as their first stage outside the Middle East. to challenge Europe as a Christian domain, Europe’s political infrastructure and eventually to convert Europe to Islam. They already promised times and again to raise the flag of ISIS on Rome, the Vatican more specifically. They have several tools to promote their objective ; A. To incite the Muslim population already living in Europe against the political order they are living in; B. To flood Europe with Muslims ; C. To penetrate ISIS elements to Europe, using the refugees flood and to combine them with supporters of the idea in Europe and D. To establish a strong base of operation as close as possible to Europ. 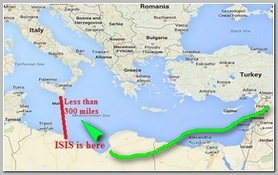 The two optional bases are the Muslim populated regions in the Balkans and the shores of Libya. In Libya I.S.I.S already managed to consolidate over 200 k”m of sea shores to a degree that President Obama is beeing pressed by his military advisers to send U.S. forces to Libya according to Media reports on Thursday 02/05/2016. In the last weeks there are several reports that ISIS senior commanders are fleeing Syria and Iraq to North Africa, the Maghreb, and more specifically to Libya. It is much more likely that they are preparing the ground and building the base for the next stage of ISIS’s war against Europe in Libya and the coming attacks on Europe – It is much more likely that ISIS is building its next offensive rather than fleeing from Iraq or Syria.